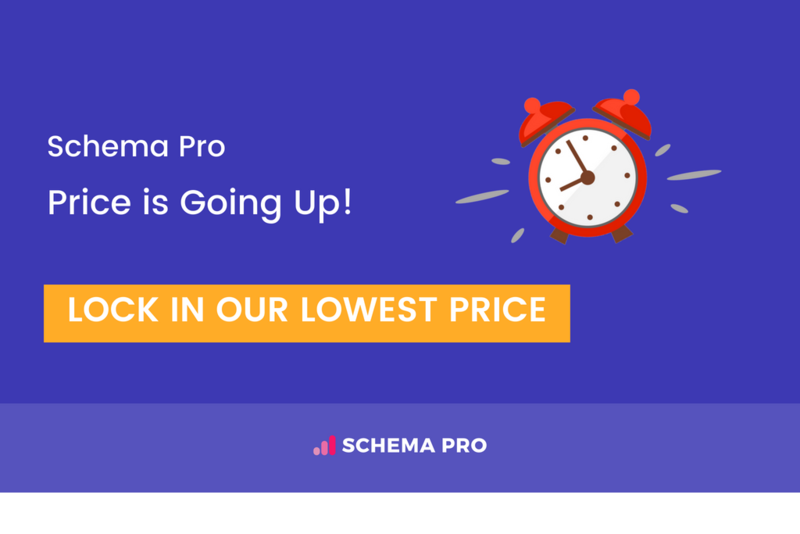 Schema Pro Price is Going Up! Lock the Lowest Price for a Lifetime now! It’s been 9 months since we launched Schema Pro with an introductory price of $59 per year and $199 lifetime for the unlimited site’s license. Ever since the launch we’ve worked tremendously to improvise Schema Pro and take it to the next level. To more accurately reflect the value users gets from Schema Pro and continue our efforts to help you outperform your competition in search engines, we are increasing the prices. The price hike will be effective from 10th September 2018. Important: This price change will NOT AFFECT existing users. All our existing customers with the active subscription will be grandfathered and they will remain locked for life. You can take advantage of this too! Before the prices shoot up, you can buy Schema Pro now and lock the lowest pricing plan for yourself. If you are not a Schema Pro customer yet, purchase Schema Pro before 10th September 2018 and lock the price. If you own an annual license of Schema Pro and wish to upgrade to the lifetime plan, you can do that now before the prices go up. How will this price change affect the active subscriptions of existing customers? This price change will NOT AFFECT existing users. All our existing customers with the active subscription are grandfathered and will remain locked to the same renewal plan that’s chosen.